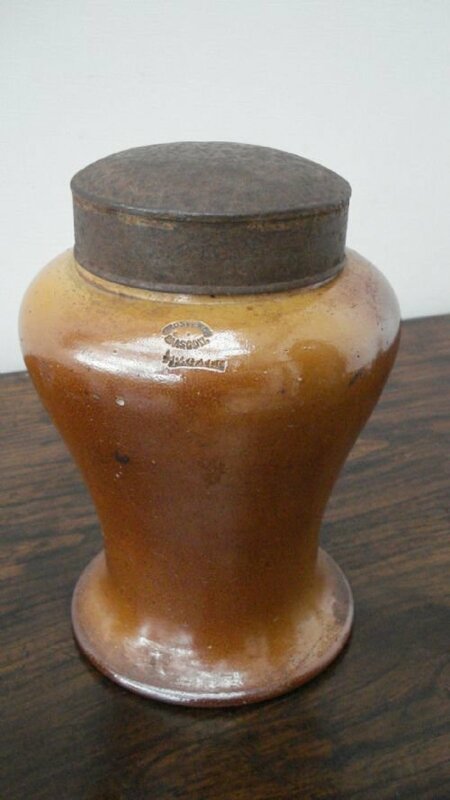 In 1869 the Eagle Pottery was built in Bridgeton for Frederick Grosvenor, an earthenware manufacturer. Pottery manufacture in the East End was more commonplace than we may think today. Besides the Eagle Pottery other local sites include the Wellington Pottery at Wesleyan Street (later the site of Milanda Bakery), Bagnal’s Pottery at Tureen Street and Govancroft at Auchenshuggle. 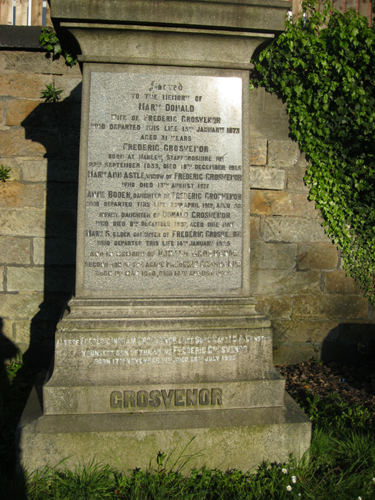 Frederick Grosvenors widow Mary Anne Astle died 13 August 1917. 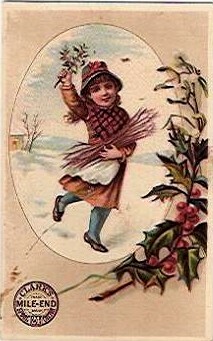 His Daughter Anne Boden Died 23 April 1919. 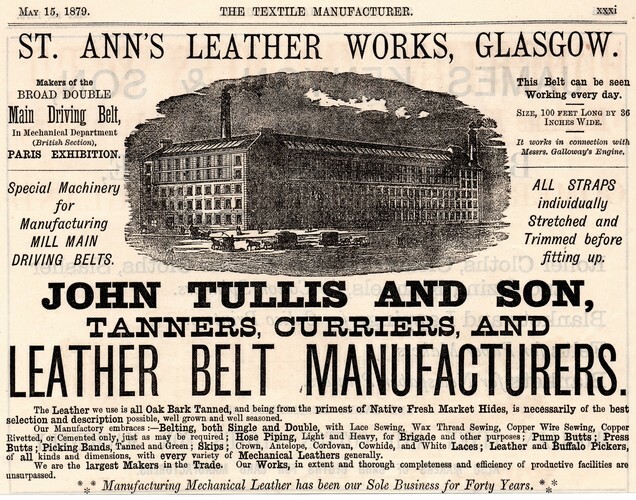 In 1869 John Tullis & Son founded the St Ann’s Leather Works at John Street in Bridgeton. The firm manufactured leather driving belts for machinery, and the factory was named after Ann Tullis, the family matriarch. The manufacture of driving belts was a very important component in the workings of the looms and machines in the surrounding weaving and carpets factories. 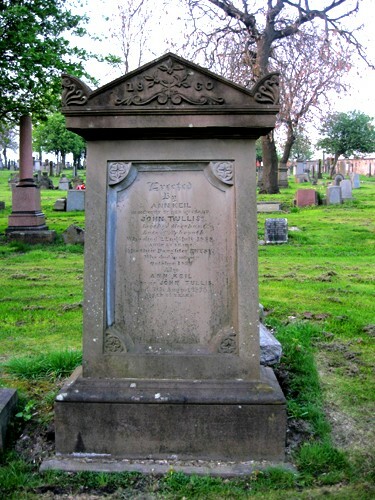 In the mid 1920’s it was decided that John Street in Bridgeton was to be renamed, as Glasgow already had a street of that name, and the thoroughfare became Tullis Street, acknowledging the importance of the Tullis family to Bridgeton. The naming of streets after local firms has occurred elsewhere in the East End, notably Templeton Street and Arrol Street. George Laird and Sons Ltd, 10 Ann Street, Bridgeton.were upholsterer, joiner and cabinetmakers and most of the family lived in the Bridgeton area. Ann Street was later named Laird Place after the family.2/Lt Arthur Donald Laird 17th Bn. HLI was killed on 1 July 1916 in France, aged 26. He was the nephew of Dr Laird Cambuslang. 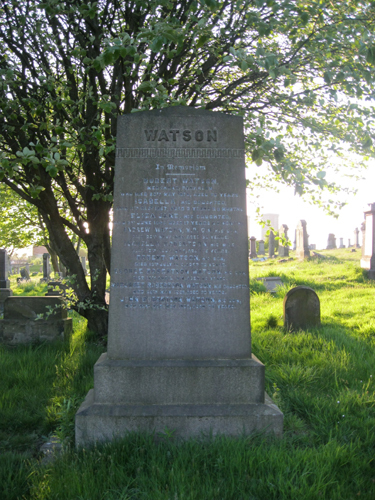 A prominent athlete in the West of Scotland, he had an excellent record in rugby, and also played cricket for Glasgow Accies and West of Scotland. His parents were George H. and Mary Jane Laird, of 7 Park Drive, Glasgow. He was captain of Glasgow Academy in 1908. According to his C.O. he died a gallant gentleman heading his platoon into battle in the most cool and capable manner. 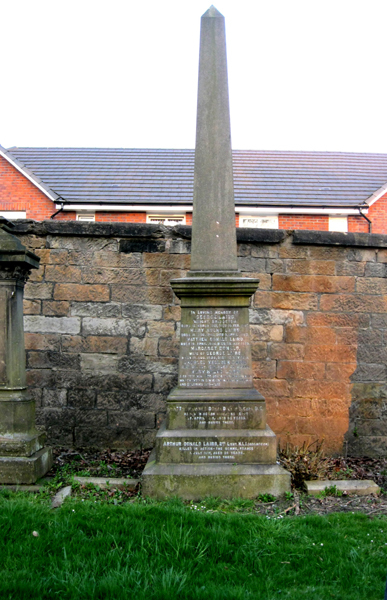 In civil life he was a director of the family firm of George Laird and Sons Ltd, 10 Ann St., Bridgeton. At the outbreak of war he enlisted as a Private in the Commercial Bn (17th. HLI) and was commissioned in Dec 1914. He is buried in Blighty Valley Cemetery, Authuile Wood on the Somme. His eldest brother, Capt G. H. H. Laird HLI, was severely wounded at Gallipoli about a year later and his only other brother Capt W. W. Laird RA served in Egypt. Capt Matthew James Donald Laird, (uncle of 2/Lt Arthur D Laird), Royal Engineers, earlier posted missing, is now found to have succumbed to wounds sustained in hard fighting at Katia, Egypt. He died on 23rd April 1916 in hospital at Kantara, Egypt, aged 41 and is buried in the Military cemetery there (on the east bank of the Suez Canal). He spent several years before the war in the Queens Own Yeomanry, resigning in 1903. He rejoined the army at start of this war, was commissioned in the Engineers 1914 and promoted Captain in June 1915. He served at Cape Helles, Gallipoli until the evacuation. He was the son of George and Margaret Donald Laird of Glasgow. Before the war he was a Director of the family firm of George Laird and Son Ltd. In the early days of weaving in Bridgeton and Calton, much of the work was carried out in cottages and dwellings with looms set up within the households. As mass product ion arrived with the Industrial Revolution, Glasgow became a major centre for powered spinning factories. An early example of this was the Mile End Thread Works founded around 1818 by John Clark Junior. Over the years the site was much developed, to be eventually replaced by the engineering works of Mavor & Coulson. 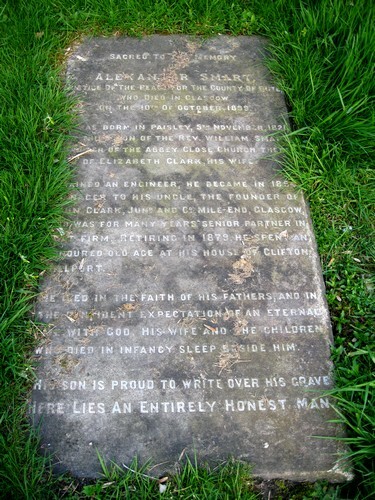 Alexander Smart who was a son of Rev, William Smart of Paisley ,at that time was carrying out an engineering business at Barrhead ,but in the following year he was included by his mothers brother,John Clark, the founder of the firm John Clark Jnr,and Co,to join the important business carried on at Mile End Thread Works Glasgow. He became manager of this ,and was for many years before his retirement in 1879 senior partner in the firm.